Penny couldn’t believe her luck when they first arrived at Oak Tree House, the grand country estate where she would be spending the week to celebrate her sister’s 30th birthday along with her mum and aunt. Guarded by two gigantic oak trees, the empty house stands alone within Oakdene, a quiet and desolate village. She ignores her mischievous aunt as she jokingly tries to convince them that their rented apartment is haunted the moment they step foot inside. Always rational, Penny tries to place logical explanations to unexplainable events that start occurring from the very first day. When these encounters become more and more frequent, and more terrifying, Penny cannot avoid it anymore. Someone, or something, is staying in the apartment with them and Penny needs to find out what it is and more importantly, what it wants from her? The House Beneath the Oak Trees is Faye Belle's debut novel which was published straight to Amazon at the end of last year. If this novel is anything to go by then I'm excited to read the future works of Faye because I absolutely loved this book! When Penny and her family arrive at Oak Tree House, they can't help but be a little bit disappointed with what they're met with. They're were promised a modern, renovated holiday apartment and instead they find themselves in a place that looks like it hasn't been touched since the house was built. The rooms are cold, there's a strange locked door, furniture seems to rearrange itself and the upstairs neighbours are loud, despite Penny's family being told they're the only ones on the property. As time goes by things start happening that just don't have a rational explanation and it becomes apparent that something in the house is targeting Penny, but why? And how will Penny solve the mystery of Oak Tree House? Given that the evenings are getting darker and colder, I was looking for something suitably scary to start out autumn with and The House Beneath the Oak Trees seemed like it would fit the bill. I absolutely raced through the book desperate to know what would happen next and how it would end, although I had guessed part of the end reveal early on in the book I was still caught by surprise with the twist and the end. I just hope they'll be a second book to follow on the story now! I have to say the book did genuinely scare me, I tend to read on an evening just before bed and the book successfully managed to make getting up for the bathroom in the middle of the night a terrifying experience. 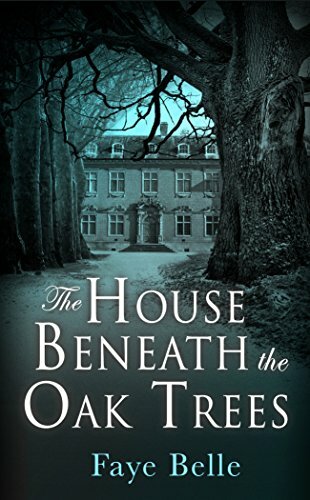 For a debut novel, I think The House Beneath the Oak Trees is fantastic, it's gripping, well written and firmly cements itself in the horror genre. If you enjoy cosying up with a spooky book in autumn like I do then you really should add this book to your collection.